Italian rabbi and author of the first half of the eighteenth century. He was a pupil of N. Pincherle, and rabbi at Reggio, Leghorn, and Triest. He wrote "Bet Dawid" (House of David), on the Mishnah; at the end of his work are diagrams relating to certain halakic points, and showing considerable mathematical knowledge (Amsterdam, 1738-39). Corinaldi also wrote notices on the Shulḥan 'Aruk, part of which were published by Azulai. 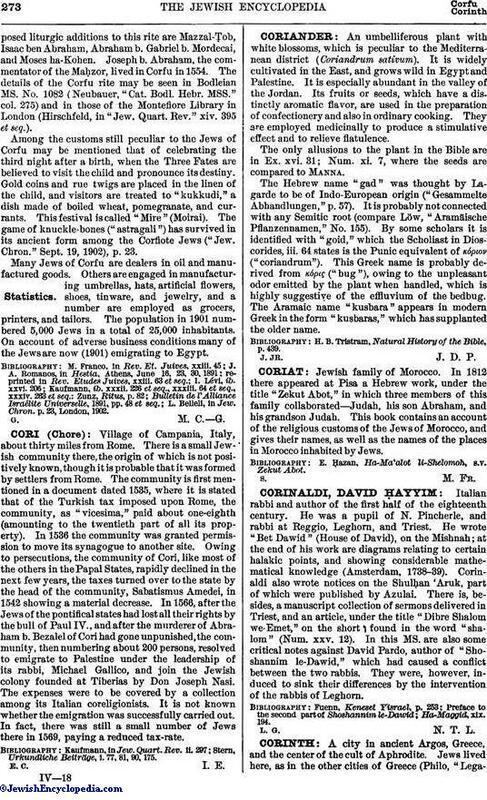 There is, besides; a manuscript collection of sermons delivered in Triest, and an article, under the title "Dibre Shalom we-Emet," on the short ו found in the word "shalom" (Num. xxv. 12). In this MS. are also some critical notes against David Pardo, author of "Shoshannim le-Dawid," which had caused a conflict between the two rabbis. They were, however, induced to sink their differences by the intervention of the rabbis of Leghorn.